Mitchell Lerner is Associate Professor of History and Director of the Institute for Korean Studies at The Ohio State University. 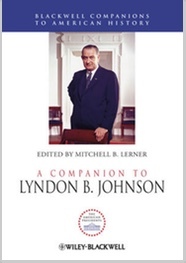 He is the editor of "A Companion To Lyndon B. Johnson" (Wiley, 2013). Among the many topics recently covered by the international media are two that, on the surface, appear unrelated. On August 20, former president Jimmy Carter announced that he had cancer. Although he appeared optimistic, Carter’s prognosis was clearly serious. “I’ve had a wonderful life, I’ve had thousands of friends, and I’ve had an exciting and adventurous and gratifying existence,” he told a press conference. “Now I feel that it’s in the hands of God.” At almost the same time, a crisis was unfolding on the Korean Peninsula, where North Korean leader Kim Jong Un had ordered military units into offensive positions, ready to strike in retaliation for South Korea’s alleged provocation of blaring propaganda messages into the North from loudspeakers positioned along the border. Although tension between the two Koreas is nothing new, this most recent outbreak ranked among the worst of recent years, with Kim mobilizing his nation’s submarine fleet and declaring a “quasi-state of war.” Few, if any, publications mentioned Carter in their coverage of the latest Korean crisis, and it seems unlikely that many readers made a connection on their own. But there is in fact a relationship between the two topics, one that needs to be recognized in any understanding of current tensions on the Korean Peninsula or in any evaluation of the historical legacy of Jimmy Carter. Carter’s announcement about his health triggered an outpouring of praise for the former leader, most of which focused on his post-presidential years rather than his years in the White House. “You have to admire someone who has dedicated so much of his own life to helping others, in ways both large and small,” wrote one Los Angeles Times reporter. “History isn’t done with Carter yet, but his post-White House life may well be the one he was best-suited to lead.” This post-presidential focus is not surprising, since Carter left office with an approval rating below 30% and a loss in the 1980 presidential election that ranks among the worst in American history. His subsequent years, however, helped repair his image, as Carter developed a reputation as an international peacemaker, a trouble-shooter who could be counted on in almost any effort to advance the cause of democracy and justice. In 2002, he received the Nobel Peace Prize, honoring his efforts “to find peaceful solutions to international conflicts, to advance democracy and human rights, and to promote economic and social development.” Yet, as the nation applauds the many noble contributions he made, it cannot ignore a critical part of his post-White House legacy that continues to haunt American policymakers and which, ironically, helped create the situation that shared the headlines with him last week: his intercession in the Korean crisis of 1994. In Washington, the Clinton administration seriously considered the use of force. “We felt that that [the North’s actions] would bring a potentially hostile nation to the United States across the nuclear finish line and that that wasn't acceptable to us,” recalled Assistant Secretary of Defense Ashton Carter. “We were not, by any means, confident that we could talk them out of taking that step, and therefore we looked into the possibility of compelling them by force to set back their nuclear program.” In mid-May, Secretary of Defense Perry and Chairman of the JCS General John Shalikashvili summoned every active four-star general and admiral to a secure Pentagon conference room, where plans were discussed to ensure that the US was militarily ready in case the nuclear standoff sparked a second Korean War. It was not just a theoretical exercise, one of the planners acknowledged. It was “a real meeting of real war fighters to decide how they were going to fight a war.” The next day, military leaders briefed President Clinton on the discussions and pulled no punches, warning of the serious toll in lives and material that such a war would require. They would be ready, however, to take such steps if diplomacy failed. One possibility that was seriously considered was a plan for a strike against the Yongbyon facility with cruise missiles and F-117 stealth fighters that would, in theory, bury the plant without flooding the area with radiation. Officials recognized that if the strikes were launched, the North would likely respond with attacks across the peninsula. "I believe it would have resulted almost certainly in war," recalled Assistant Secretary of State Robert Gallucci. As American officials considered their options, however, Jimmy Carter interceded. Carter’s work as an international mediator had led Pyongyang to invite him to visit in previous years, but the ex-president had always rejected the invitation at the request of the State Department, which was concerned that he would impede behind-the-scenes negotiations and might alienate South Korea. Some administration officials also worried that the ex-president was a bit of a loose cannon who could not be trusted to act within the larger diplomatic framework that the administration had implemented. The severity of the 1994 crisis, however, had changed the calculus. Carter now reached out to Vice President Al Gore to report that he had confirmed with Pyongyang that the invitation to visit still stood, and indicated that he wanted to make the trip. A number of officials opposed Carter’s involvement, fearing that the ex-president would seek to make a deal that went beyond his instructions. After some intense discussion, Clinton overrode them, hoping that the visit would offer Kim Il Sung a face-saving way out of the predicament before it was too late. Still, the administration placed limits on Carter’s role. The former president, everyone agreed, would present himself as a private citizen on an independent trip, not as an official government spokesman, and was not empowered to enter into any agreements. 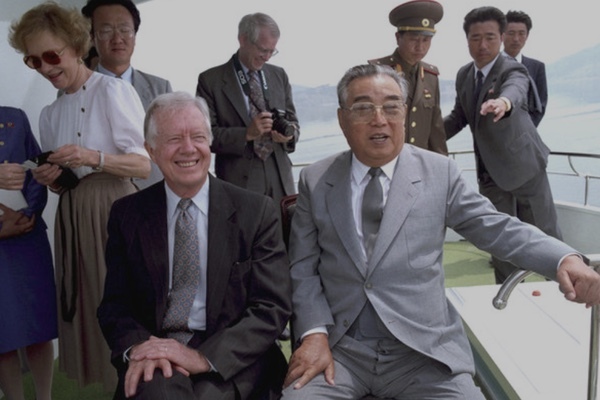 Carter entered North Korea on June 15, and met personally with Kim Il Sung the next morning. Going far beyond his instructions, he described the American effort to impose sanctions as a serious mistake, and reached out to Kim with specific proposals designed to end the standoff. Quickly, the two men reached a tentative agreement: the US would support the DPRK’s efforts to obtain light-water reactors to help with the nation’s energy needs, and would restart negotiations designed to improve overall relations; in return, the DPRK would allow IAEA inspectors to remain in Yongbyon to monitor the reprocessing of the fuel rods. The last detail was particularly troubling, since both administration policy and international agreements (along with the fierce desire of the government in South Korea), forbade the North from reprocessing fuel rods, even with IAEA inspectors present. Still, Carter assured Kim that he would try to make it happen. Admitting that he could not make a promise on behalf of the administration, Carter pledged to recommend the agreement to them, and indicated that he would soon go on CNN to urge the American government to accept the deal and to withdraw the sanctions resolution. A public statement from a former president suggesting that a peaceful resolution was close at hand, he obviously knew, would make it very difficult for Clinton to reject the proposal, especially at such a tense moment. In the middle of this critical meeting, a White House aide entered the room to inform the participants that Carter was calling from Pyongyang. Gallucci left to take the call, and was startled to hear that the former president had not only negotiated the framework of a deal, but was about to appear on CNN to announce it. Gallucci returned to the meeting to report on this new development, and then sat with the others while they watched Carter’s press conference. Reaction inside the administration was furious, with one aide describing the actions as “near traitorous.” Carter himself later admitted he was trying to force the administration’s hand. “I can't deny that I hoped that it would consummate a resolution of what I considered to be a very serious crisis,” he later told a reporter. Nevertheless, the Clinton team appeared to be boxed in, and had little choice but to go along with the proposed settlement. Gallucci and others drafted a more specific proposal articulating a series of required DPRK actions, some of which Carter objected to as too demanding, but which Pyongyang accepted. More details still needed to be resolved, but the immediate crisis was defused. Carter’s intercession averted a possible war, one that would likely have had tremendous consequences, and it became the basis for what would become the 1994 Agreed Framework. Yet, those who now celebrate his post-presidential legacy of peacemaking need to consider the long-term consequences of his actions in North Korea. The immediate ramifications of the Yongbyon strike or even a tight sanctions policy in 1994 would likely have been severe. The costs of inaction that summer, however, proved to be far more severe over the next decades. The Kim family remained in power in the North, perpetuating one of the most brutal totalitarian regimes in modern history. The country continued its nuclear efforts in defiance of the 1994 agreement, and is now believed to have 15-20 nuclear weapons and significantly improved delivery systems, along with a massive collection of chemical and biological weapons as well. It continues to harass the South and threaten the stability of East Asia, and is an active player in the international black market for nuclear technology, narcotics, and counterfeit American bills, among other things. Carter’s intervention in 1994 was no doubt a genuine reflection of his deeply-held humanitarianism and a product of his belief in the efficacy and moral superiority of choosing diplomacy rather than force. It also, however, reflected his failure to appreciate that sometimes the short-term negative consequences of force are outweighed by the long-term benefits. The world has been paying for that mistake for the last two decades.